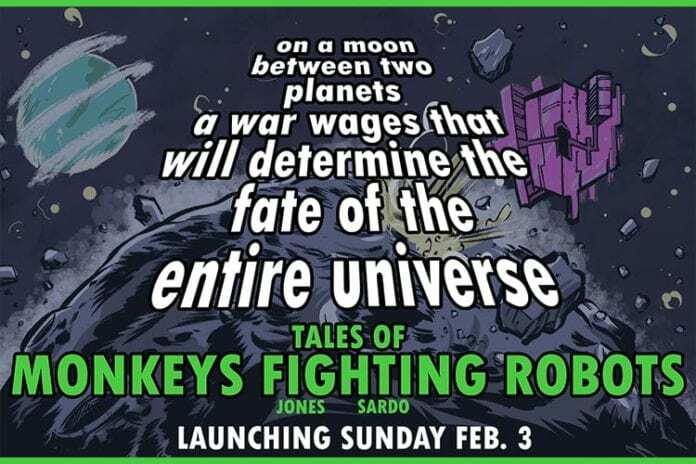 Friday afternoon, Monkeys Fighting Robots announced its first digital comic strip, Tales of Monkeys Fighting Robots with art by Jamie Jones and the occasional words by Matt Sardo, will debut Super Bowl Sunday, February 3. The best way to describe the series is if Robert Rodriguez directed Band of Brothers, with monkeys. The war between monkeys and robots has raged on for eons; these are the stories that have survived. 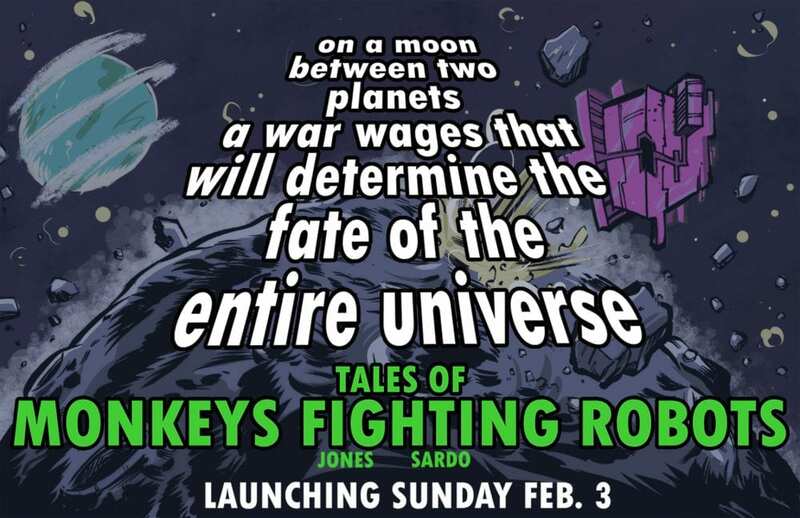 Tales of Monkeys Fighting Robots will hit the web every Sunday. The artist of the series, Jones, is big into Dungeons & Dragons, and you’ve seen his work on The Whisper, Paper Boy, Dodger, LUCHA UNDERGROUND, FIVE GHOSTS, and Joey Ryan: Big in Japan! Sardo, on the other hand, is training for his next job as an astronaut cowboy. A reformed hockey goon, Sardo has worked in and around the comic book industry since 2006. Each week’s comic strip will be posted on the homepage of Monkeys Fighting Robots, and to catch up on the series you can visit the Tales of Monkeys Fighting Robots archive.